According to Historian Stravon, Lambousa was built in 1300 BC by Hellenes, (Greeks) and more specifically from Praksandros coming from Laconia in Peloponese Greece. Praksandros and Kifeas are also the founders of the town of Kyrenia. Lambousa was gaining glory and wealth since the beginning but especially during the times of Alexander the Great, Greek commander of Hellenes from the kingdom of Macedonians (330BC) and beyond. Hellenistic, Roman and Byzantine (Greek) eras proved to be the most prosperous and Lambousa became an important administrative city with a Gymnasium, a semi-cyclical Greek Theater, public buildings and dockyards, as well as harbor for merchant shipping between Greece and the Roman provinces. Lambousa's Ancient Greek, and then Byzantine (Greek) name means the 'Shining'. Unfortunately Lambousa was destroyed in the 7th century during Arab raids. The town wall, the rock-graves which have been the popular hunts of treasure seekers, and served as stone quarries, and the fish tanks are among the ruins of the Roman period which have survived to the present day. The archaeological excavations at Lambousa have been recovered ILLEGALLY by barbarian Turkish military occupation authorities in occupied Cyprus since 1992. An ancient cap also found in the area. 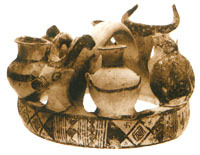 Cups similar to this can be found in museums all over Europe and the United States. Many ancient treasures were illegally exported and sold to many countries after the 1974 Turkish invasion. 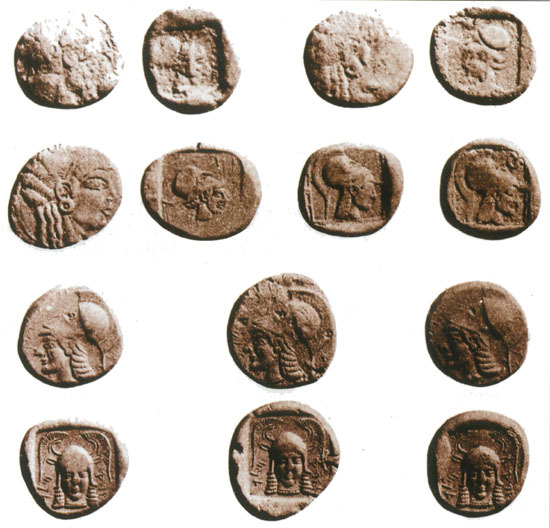 Another sample of the wealth of the people living in the area is the large numbers of ancient coins found. Golden coins were very common, but also silver and copper ones were found in the area. An ancient religious instrument found in excavations in Lambousa. 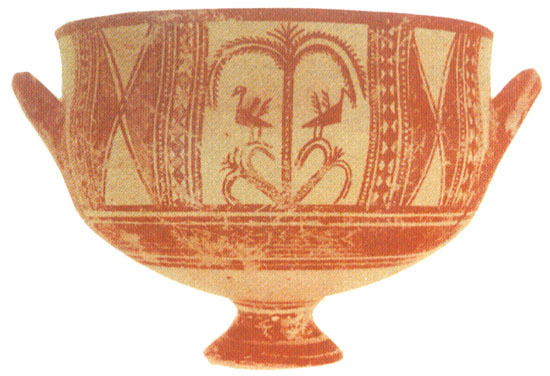 Very often people used to find ancient vases or other things during their daily activities in the fields. The whole area was very rich and densely populated since the ancient times. 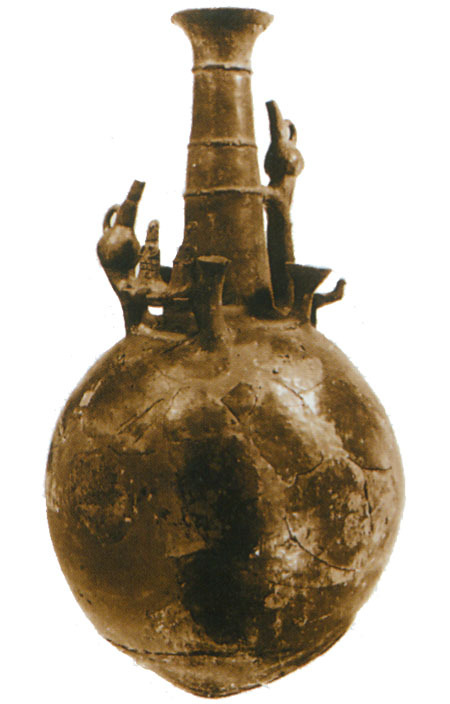 Pots like the one depicted here were used for holding wine, olive oil or water. Lapithos was also known for the quality of the olive oil that was produced there. This is a small sample of the treasures found in the city. After the Turkish invasion many of the treasures were smuggled abroad. They can be found in museums all over Europe, but mainly in England and France, as well as in the United States. Many were also sold to private collectors. 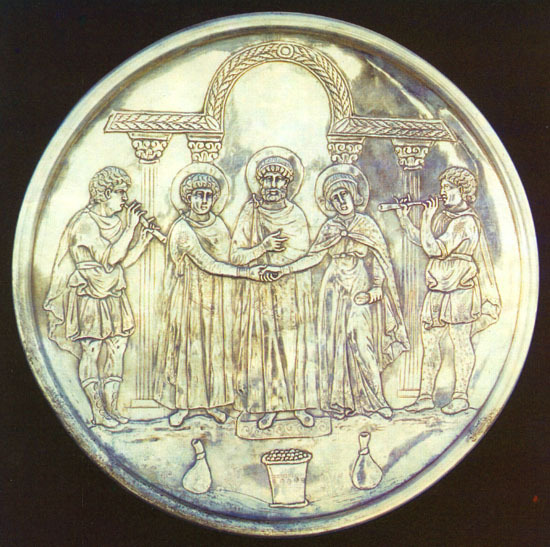 A silver plate found in Lambousa. In 627 AD, the Byzantine Emperor Heraclius (610-641), fought the Persian general Raztis in single combat and beheaded him. 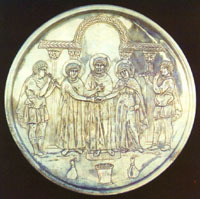 Afterwards, having compared his victory with that of David against Goliath he issued some commemorative silver which is today known as the David plates. They were found in about 1900 in two stages in the vicinity of Lambousa and eventually having been split up into four, ended up in the museums of Nicosia, New York, Washington and London. Obviously they were buried in haste just before the Arab pirates arrived. These silver vessels, of which the largest depicted David against the giant Goliath, are regarded as among the finest examples of the art of the early Byzantine era. Since most of them bore imperial control stamps, they were closely dated as being from the years 627-630 AD.